Georges is a boutique hotel in the Galata area. Every single part of Istanbul is full of stories. Every neighborhood is historical. The streets, in which history blends with modern trends, have long been centers of attraction for both local and foreign tourists. One of these neighborhoods is Galata. Being a part of the Beyoğlu district, Galata is the name of the region between the Tophane district and the Galata Tower. It is a neighborhood full of arts and entertainment with famous art galleries, historical baths, modern cafes, boutiques hotels and restaurants. The name of the region Galata was derived from the word "galata," which means "the road to the sea" in Italian. In ancient times it was called Sykaena. It is written that in those ancient times Galata was a small town surrounded by walls, a church, a bath, a theater, five mills, 400 houses and 40 city guards. The heyday of Galata starts in the 12th century with the Genoese settling here with some privileges. It was then captured and ruled for a while by the Venetians. After the 13th century, the region was a Latin colony governed by the Genoese. For almost 200 years until the conquest of Istanbul, it was an independent Genoese city. You can explore traces of this history as you walk around Galata streets. Galata Tower seen among other buildings. Undoubtedly, Galata Tower is the landmark in the neighborhood today. Of the 24 towers that made up Galata's urban fire defense system, the one that survived until today is the famous Galata Tower. It is also the most monumental of them all. In 1350, this tower of gigantic size, which the Byzantines called Megalos Pyrgos (Great Horoscope) and the Genoese's Torre di Cristo (Jesus Tower), was completed with the support and assistance of Ottoman Sultan Murad II. It changed shape several times in the Ottoman period. Today, it is conserved in the way that it was shaped in the 1830s. The observation deck on the top floor of Galata Tower, with a diameter of 165m and a height of 68m, continues to fascinate visitors. Here, you can enjoy the amazing view of the historical peninsula and the Bosporus, while having a delicious dinner in the restaurant on the same floor. After your dinner in Galata Tower, listen to famous Turkish Jazz artists at Nardis Jazz Club, which is located on the street just behind the tower. Another important historical point in Galata is Galata Mevlevi House (Whirling Dervish Hall). It was built in 1491 during the reign of Ottoman Sultan Beyazid II. The octagonal building in baroque style was turned into a museum in 1975. Here lie the tombs of some of important Mevlevi dervishes who had been the Sheikhs. Old Turkish music instruments as well as some art works belonging to Mevlevi culture are exhibited in this Mevlevi house. Semazen (whirling dervish) shows are organized on certain days of the week. You should definitely attend this spiritual event, which is accompanied by wonderful music. On the other hand, there is the modern face of Galata with full of cafes, restaurants and hotels. And I think Georges is the best boutique hotel in the neighborhood. This hotel, located on the street that lies just opposite Galata Tower is full almost every day. The hotel that Alex Varlık owns is a building that combines modernism with history. Alex, the son of the famous painter Utku Varlık, passes on the passion of art, from his family to every corner of the hotel. In this regard, we can say that Georges Hotel is a boutique design hotel. Varlık is a real entrepreneur. He is a businessman known for his tourism venture in Turkey and around the world. Born and raised in Paris, Alex is very sympathetic for his Turkish with French Accent and a lover of Turkey. He and Kerim Kamhi designed this 20-room hotel and opened it in 2011. The building where Georges is located is a historical monument. After a major renovation, it has been upgraded to its present great condition. You may enjoy the view of Galata Tower while sipping coffee, sitting around the chic tables in front of the hotel's door and watching passers-by on the cobblestone street. Art galleries, clothing shops and cafes located on the street add a distinct modern feeling to the historical atmosphere. The cafe area on the entrance floor will make you feel you are in Paris or London. Dark wood floor coverings, ceilings covered with paintings, leather seats, antique fireplace and paintings above the fireplace, create a great atmosphere. The most spectacular part of the hotel is the terrace area. It has a unique historical peninsula view. On the terrace, you will find wooden bar area and cozy armchairs; it is famous for the food and cocktails it offers. Apart from breakfast and dinner, it is also ideal for special events. 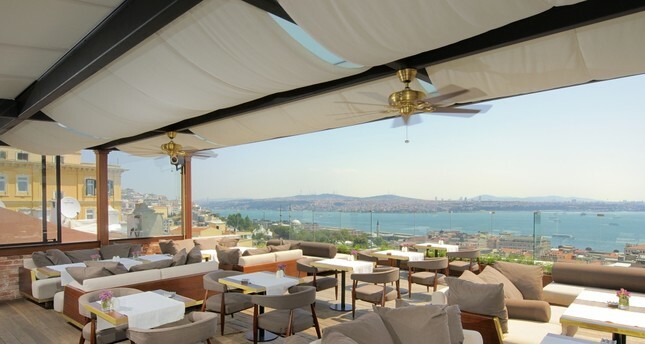 Especially at sunset, I recommend you try signature cocktails at the venue with the view of Topkapı Palace. The rooms are quite stylish and modern. Almost all have either a Galata Tower or Bosporus view. You get the feeling that someone has spent time thinking about the design of the hotel when you see the materials used in the rooms and the functional details. The high ceilings and parquets remind you that you are residing in a historical building. I congratulate Alex Varlık, Georges Hotel General Manager Fulya Ulusoy and his team for doing an excellent job in the heart of Galata. Pay a visit the first chance you have!